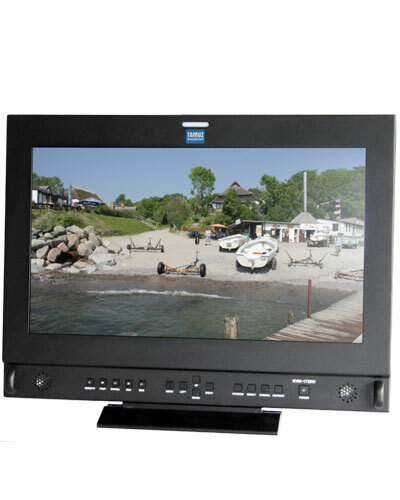 Available to hire we have this broadcast quality HD-SDI LCD monitor from German broadcast engineering company Tamuz. This is a 17 inch wide screen full HDTV 1080 50/60p 3GSDI field monitor with 2 inputs supporting picture in picture. Supplied with a heavy-duty rolling light stand, but can be mounted on any light stand or 5/8 spigot via a heavy-duty adjustable VESA mount bracket. Model detail is Tamuz KVM-1730w. The monitor has a range of inputs including 2x 3G-SDI input (with 3G-SDI loop through to attach to a second monitor), composite/component input and output input, and DVi/HDMI input. You can switch between them all from the menu. It also supports a basic vectroscope, blue-only, tally light, audio meters, image flip, zoom and scaling, underscan, overscan, interlace and progressive formats including psf. This monitor can be switched between interlaced and progressive formats and is ideal for use in the field as a Directors monitor or on-set grading monitor or for a focus puller to help pull focus. The monitor supports HD and SD video formats including 2048p/psf, 1080p, 1080i, 720p, SD PAL/NTSC in 4:3 and 16:9 modes and psf mode. The monitor can be set into PSF mode or interlaced mode and can display both interlaced fields separately if needed. Various scaling options exist for 4:3, 16:9 and 2:35:1 (anamorphic) video and fully custom scaling and custom zoom and crop. The monitor powered via a mains adapter (supplied). It is fitted with a VESA monitor bracket to be mounted onto a heavy-duty lighting stand / standard baby-pin and is ideal as a directors monitor on set or in studio for colour grading. The monitor is shipped in a Peli hard case for protection. Can be supplied with right angle light stand adapter to allow you to view in portrait mode for close up green screen work. See the monitor data sheet for more information. For more information, please visit this equipments webpage.